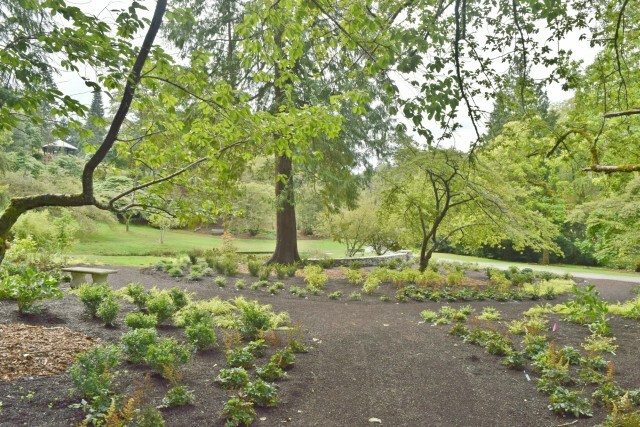 In mid-September, the Washington Park Arboretum opened its newest ornamental display—the Azalea Way Centennial Garden—to the public. 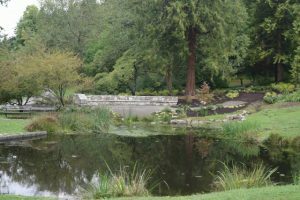 Located by the pond at the south end of Azalea Way, the summer-themed garden celebrates the 100th anniversary of the Seattle Garden Club, which has a long and influential history in the Arboretum. Collaboration was at the heart of the project. 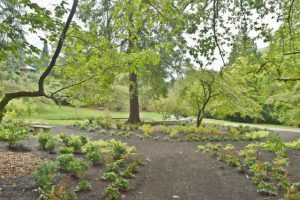 The three Arboretum partners—UW Botanic Gardens, Seattle Parks and Recreation, and the Arboretum Foundation—created the new garden using a grant from the Garden Club, along with matching funds from the Foundation. Jason Morse of the firm AHBL and Iain Robertson of the University of Washington Landscape Architecture Department worked together on the design, in consultation with all the stakeholders. View from the garden’s stone bench south to the Overlook gazebo. View of the garden beds from under the tree canopy, facing north. The centerpiece is a long, curving, stone bench offering views across the pond to the tree-clad hillside beyond. Hydrangeas are the summer-blooming stars of the show. Cultivars of Hydrangea macrophylla, H. serrata, and H. quercifolia lead the visitor through the garden. Calycanthus, Olearia, and Alangium round out the shrub layer, while plantings of rhododendrons and enkianthus connect the garden to the spring-flowering displays on Azalea Way and the collection plantings in adjacent Rhododendron Glen. 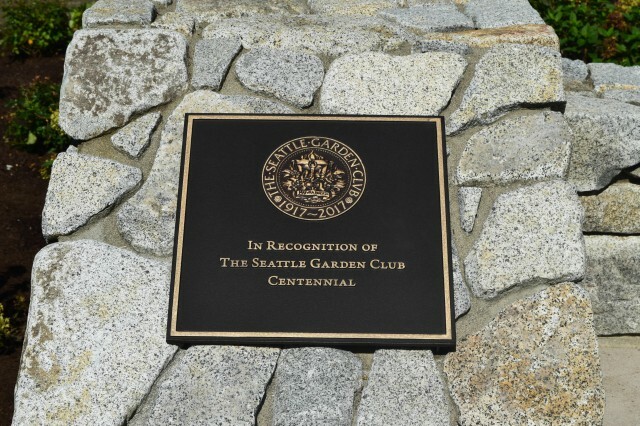 A commemorative plaque attached to the stone bench honors the contributions made by the Seattle Garden Club to the Arboretum. In the early 1930s, the Garden Club provided the funds for the original Olmsted Brothers design of the Arboretum, which included the plans for historic Azalea Way. It also funded the 2013 renovation of the Overlook gazebo, visible on the hill just to the south of the new garden. A circular mulch path curves through the garden. A view of the garden looking north from across the pond. Come visit and enjoy the new garden! 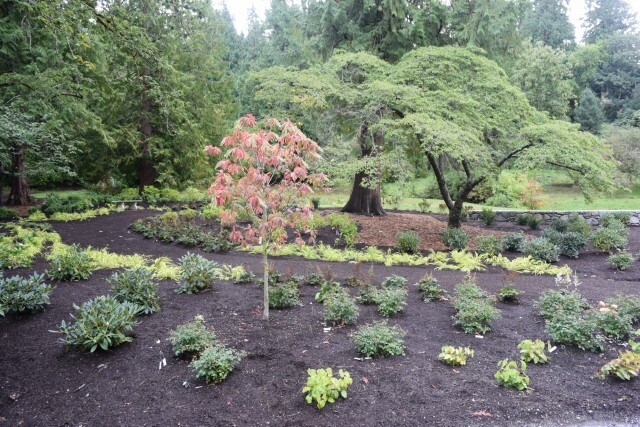 It features 600 trees, shrubs, and perennials. 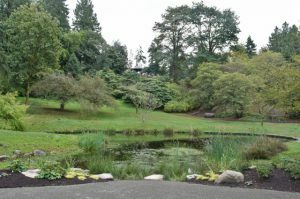 (Horticulture staff from UW Botanic Gardens planted the garden in early September with help from Seattle Garden Club volunteers.) Peak viewing will be in the summer time, but the garden’s tranquil location and beautiful hardscape make it a year-round attraction. 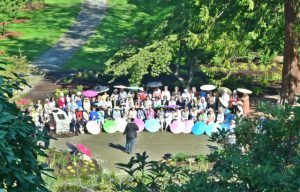 Ribbon-cutting celebration: On September 14, 2017, about 90 members of the Seattle Garden Club came to the Arboretum to celebrate the club’s centenary and formally open the new garden. Representatives from the Arboretum Foundation, UW Botanic Gardens, Seattle Parks and Recreation, and AHBL joined the club members for the festivities, which included a parasol parade down Azalea Way, a ribbon cutting at the stone bench, and a luncheon at the Graham Visitors Center. 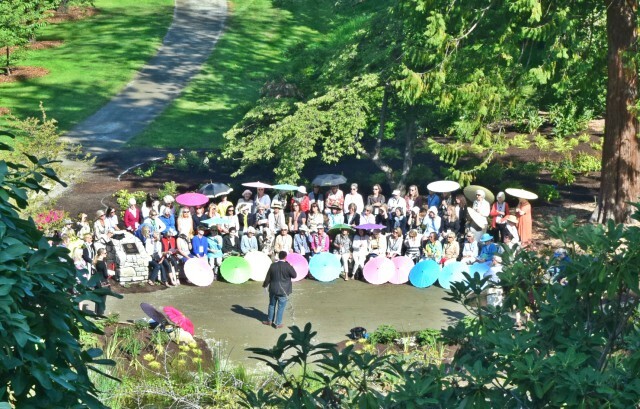 The Seattle Garden Club, photographed on September 14 from the Overlook gazebo. 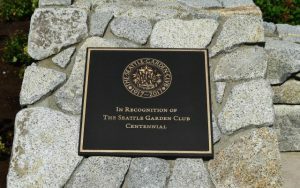 The plaque on the garden bench celebrating the Seattle Garden Club. 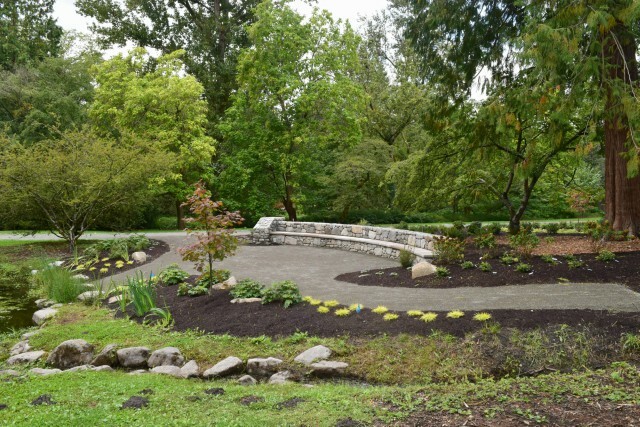 Garden design: In the latest issue of the Arboretum Bulletin, Jason Morse writes about the design plan for the garden—and the collaborative process that went in to creating it. Read full article. 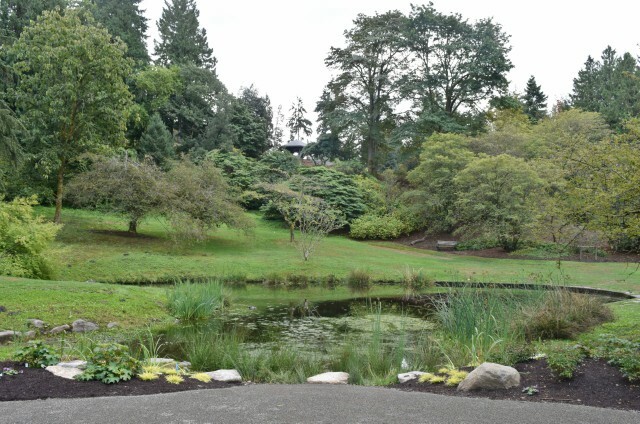 Getting to the garden: The Centennial Garden is located on Azalea Way, about a half mile from the Graham Visitors Center in the Arboretum. Visitors traveling by car can access the garden by parking at the Visitors Center and walking south along Azalea Way. It’s an easy-going 10- to 15-minute walk along the relatively level gravel path. 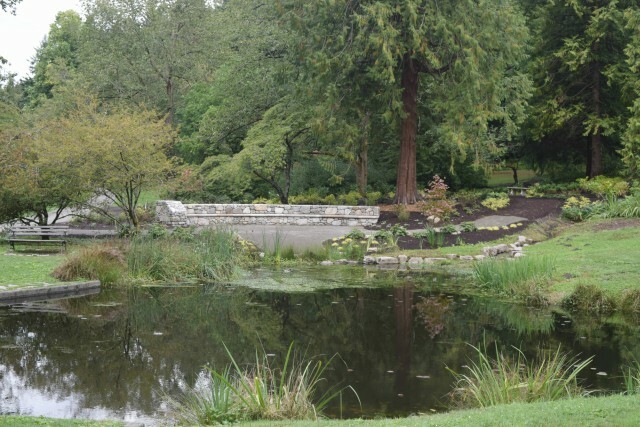 Later this fall, the City will complete the construction of the Arboretum Loop Trail, and visitors will be able to park at the new Birch Parking Lot on Lake Washington Boulevard—just north of the Seattle Japanese Garden—and walk about 50 yards to reach the Centennial Garden.